Watch the intriguing oceanfront from the Windy Hill neighborhood perch of Windy Shores II oceanfront vacation property in North Myrtle Beach, South Carolina. 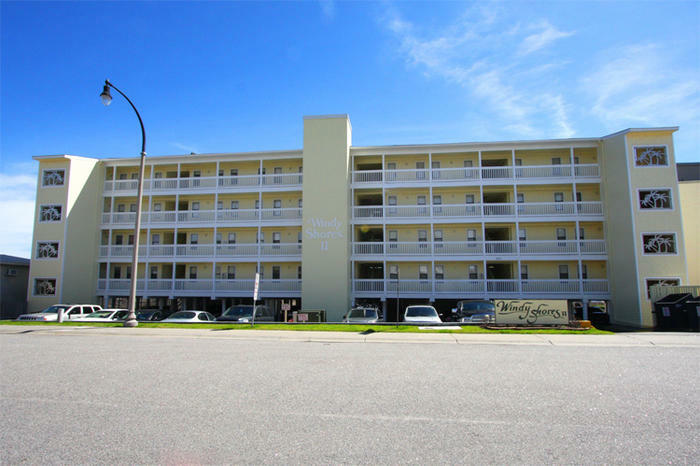 Sitting right on the sandy beach and with panoramic views from the private oceanfront balconies, Windy Shores II is indeed a pristine North Myrtle Beach resort for gazing seaward. Accommodations at Windy Shores II include two-bedroom, two-bath and three-bedroom, three-bath oceanfront North Myrtle Beach condominiums. They are superbly decorated and feature all the modern conveniences of home. The full kitchen is perfect for preparing early morning meals and the dishwasher makes for easy clean up. Separate bedrooms invite peaceful slumber while sitting on the oceanfront balcony is a terrific way to start your North Myrtle Beach vacation day. Watch the sun rise over the horizon early in the morning. The ensuing light show is a complimentary part of any North Myrtle Beach vacation and the hues of pinks and purples that dance on the water are worth getting up early. The oceanfront balcony is a destination any time of day. Kick back while you lose yourself in the pages of your favorite book or serve mid-afternoon icy cold beverages while you admire the panoramic vista from several stories above the white, sandy beaches. On the oceanfront of the Windy Shores II North Myrtle Beach vacation property, you will find a swimming pool that invites you to enjoy a refreshing dip before heading out to visit all the popular attractions of North Myrtle Beach, South Carolina. Take your pick of championship golf courses, as North Myrtle Beach golf is famous with about 100 golf courses from which to choose. Beautiful golf course settings, natural hazards and 9- and 18-hole courses are only minutes away from Windy Shores II North Myrtle Beach resort. Take your family to enjoy a fabulous seafood meal at one of the North Myrtle Beach restaurants or dine while watching a musical production at a number of Myrtle Beach live dinner theatres. Stock up on all those must have items at area outlet malls and save time during your North Myrtle Beach vacation for renting a Sea Doo or taking a parasail ride out on the Atlantic Ocean. It is all here in North Myrtle Beach, South Carolina. Elliott Beach Rentals is not affiliated with onsite management or the HOA of Windy Shores Ii.